Masterwort (Astrantia major): growing, planting, caring. Probably one oe the most beautiful flowers, if we may say! 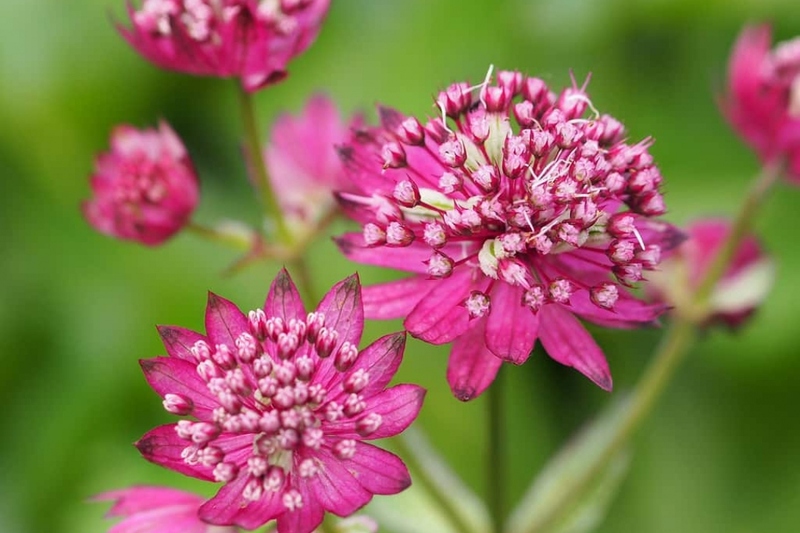 Full description for Astrantia major not yet available. From the family of parsley, fennel and carrot the masterwort carries flowers in simple umbels, unlike the other genus given as an example. These flowers are very pretty and tiny with their 5 colored petals, and are surrounded by an involucre of fine bracts that form a "collar". The most common colors are pink and white. The plant itself begins by forming a rosette of palmate or palm-lobed leaves - whose palms are cut into oval lobes... From there emerge branched and erected stems. In the axil of each branch a leaf is implanted, and the flowers grow on the top. The genus includes a dozen species native to the temperate regions of Eurasia, which appreciate the sun and the semi-shade, in a fresh soil, rich in humus and nutrients. Plant the shrubs in the spring, in cool, rich, moist soil, in the shade or in the sun. In open soil: Choose a place that is preferably partially shaded during the hottest hours. Plant the masterwort in groups of 3 to 5 to obtain a mass effect, every 40 cm. Potted: The masterwort is a large perennial, plant it in a large container (3 liters minimum). Make sure your pots are well drilled at the bottom. Put a bed of gravel or clay balls at the bottom to improve drainage. Tamp the soil well after planting to avoid air around the roots, then water thoroughly. Water regularly the first weeks, masterworts like water. In pots, we recommend to water regularly in summer to avoid drying out the plant.